Richard II tells the story of two kings. Richard is the lawful king, but he abuses his power and is ultimately deposed. Henry Bolingbroke is Richard's cousin, a member of the royal family who rises up against Richard, wins the support of the English nobility, and takes the throne for himself to become Henry IV. So this play is largely the story of the Henry's rise and Richard's fall. It's also the story of the things they learn in the process. Richard comes to a better understanding of his own humanity, his own responsibility for his downfall, and his dependence on the good will of others. Henry learns that getting the throne is easier than keeping it, and that by rising up against Richard, he has opened the door for others to do the same to him. And the events in this play set in motion the cycle of conflict and rebellion that leads into the chaos of civil war in the later plays in Shakespeare's history series. Richard II was probably written in 1595 and comes at the height of Shakespeare's "lyrical" phase, along with plays such as Romeo and Juliet, A Midsummer Night's Dream, and Love's Labour's Lost. The text of Richard II is unusual for being entirely in verse — there is no prose at all, even in the speech of the lower-class characters. Everyone speaks poetically, especially Richard, and the play contains some of Shakespeare's most beautiful and moving speeches. One of the difficulties with Shakespeare's history plays is that there are a LOT of characters, and all of them can be referred to in multiple ways — usually by their given name, the name of the place where they were born, and by their titles. So Henry Bolingbroke is named Henry, is sometimes familiarly referred to as Harry, was born at Bolingbroke Castle, and has the titles of Duke of Hereford and Earl of Derby at the beginning of the play. Later he inherits the additional title of Duke of Lancaster. So in this play he might be referred to by other characters as Henry, Harry, Bolingbroke, Hereford, Derby, or Lancaster. And later still, he is crowned King Henry IV. His uncle Thomas of Woodstock, Duke of Gloucester, can be referred to by name (Thomas), place of birth (Woodstock), or title (Gloucester). Two of Edward III's sons are characters in Richard II: John of Gaunt, Duke of Lancaster, and his younger brother the Duke of York. Two other sons are referred to in the play: Edward III's oldest son, also named Edward, nicknamed the Black Prince; and the youngest of his adult sons, Thomas of Woodstock, Duke of Gloucester. Both of them have died before the action of the play begins. 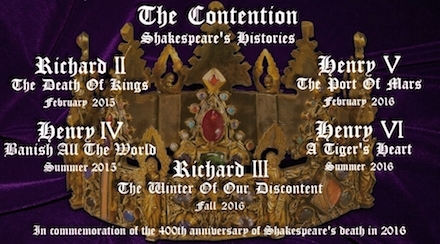 The main characters in the play are the sons of Edward III's sons — Edward III's grandsons. Richard II is the son of the Black Prince. The Black Prince died before Edward III, so Richard became king when Edward III died. Henry Bolingbroke is John of Gaunt's son. And Aumerle is the Duke of York's son. The question of succession after Richard was a troubling one. Richard had no children to inherit the throne from him, so he declared his heir to be Edmund Mortimer, Earl of March, a descendant of Edward III's second son, Lionel, Duke of Clarence. This Edmund Mortimer was still a child at the time of the events of this play, and no one wanted a child king. Who would have been next in line for the throne after Richard and Edmund Mortimer? How about Henry Bolingbroke, son of Edward III's third son...? Throughout his reign, Richard angered the English nobles by gathering groups of favorites around him, showering them with money, lands, titles, and positions, and listening to them rather than the nobles of higher status. Three of Richard's current group of favorites appear in the play (named Bushy, Bagot, and Green), and a fourth is mentioned several times (the Earl of Wiltshire). As Richard and Henry Bolingbroke come into conflict in the play, many of the other characters align themselves with one side or the other. Other than his favorites, only a few stay loyal to Richard: Aumerle, Richard's cousin, son of the Duke of York; the Earl of Salisbury; the Bishop of Carlisle, one of Richard's principal advisors; and Sir Stephen Scroop, the brother of one of Richard's favorites, the Earl of Wiltshire. The majority of the English nobility supported Henry in his campaign against Richard. In this play, his key supporters are all from northern England: the Earl of Northumberland, who acts as Henry's right-hand man; Northumberland's son Henry Percy (nicknamed Hotspur in the next play in the series); and the lords of Ross and Willoughby. About ten years before the events depicted in the play, Gloucester led a group of nobles called the Lords Appellant in a conflict with Richard II. They objected to the power and privilege Richard was giving to his group of favorite courtiers, and they managed to move against the king, break up his circle of favorites, have them executed or exiled, and put limits on Richard's power. Richard was forced to accede to their demands at the time, but he neither forgot nor forgave what they did to him. He slowly rebuilt his power until he was ready to move against them. He had Gloucester and the other leaders of the Lords Appellant arrested for treason. Gloucester was placed in prison, but he died there before he could stand trial. It was widely believed that he was murdered in prison by Thomas Mowbray...on Richard's orders. So when Henry Bolingbroke publicly accuses Mowbray of killing Gloucester at the beginning of the play, he's really taking aim at the man who probably gave the order: Richard.